The Macallan 1824 Series consists of a number of expressions that have no age statements and show off only natural colour that is derived from the oak: Gold, Amber, Sienna and Ruby. This particular expression is the Ruby, which has, as the name suggests, a deep reddish hue and dense ruby colour – all natural colour. Whisky that has no age statement is often viewed with some skepticism, and this is understandable. 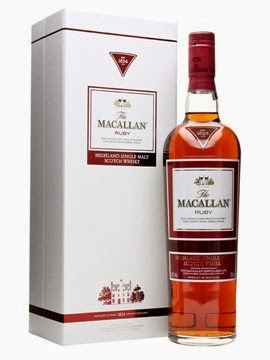 However, from the first sniff and taste, it is clear that the Macallan 1824 Series Ruby is top shelf – complex, dense, rich, mature, mouth-filling, smooth and everything you would expect of an excellent quality single malt Scotch. The age may be a mystery, but the natural colour, bouquet and taste are all that matters – and they point to very very high quality whisky. Nose: Dark chocolate, nuts and different types of cherries (black cherries with maraschino cherries) are infused with mild notes of coffee and cream that develop into tiramisu. This is a big fruit cake of a whisky, with dense sweet notes that fill the glass with hints of cream and coffee – superbly done from The Macallan. Taste: An immediate burst of preserved cherries and dark chocolate develops into prune, dates and sweetened coffee with a swirl of cream. It has a soft entry that suddenly intensifies into a tirade of bitter-sweet fruit and dessert notes – sticky date with dark chocolate, cherries and prunes. Finish: Lingering dried dark fruit – prune in particular – lingers on the palate with sparks of cocoa, mocha and the bite of black forest. This entry was posted in Highlands. Bookmark the permalink.